Onions are a must-grow vegetable. Why? Well, where to begin! To start, onions are very easy to grow and, properly prepared, bulbs will store reliably for up to six months. As with potatoes, there’s something deeply satisfying about the weighty harvest you can get from even a small area, and as the starting point to so many recipes there’s every reason to grow your own. So let’s not hang about: here’s our Sowing to Harvest guide to onions. Bulb onions come in traditional yellow and red, but look out for white varieties too, which are often bigger, milder and great thinly sliced into salads. Onions love a sunny and open site in well-drained soil enriched with organic matter such as compost or well-rotted manure. 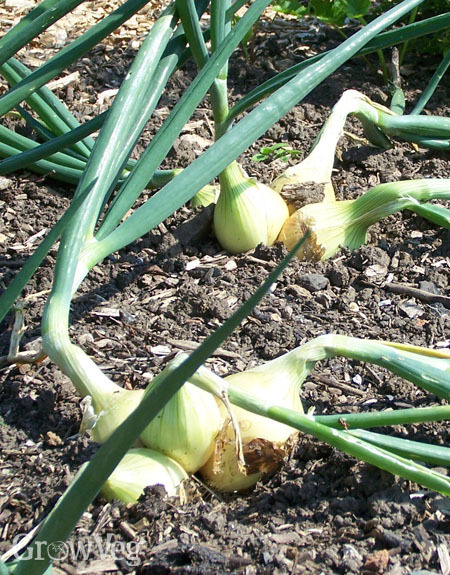 If your soil is heavy and tends to remain overly wet then grow onions in raised beds or on mounds to improve drainage. For the earliest start, sow onion seeds into plug trays or pots to transplant later as seedlings. This avoids the need for thinning out, encourages a more economical use of seeds and, given the protection of a greenhouse or cold frame, means sowing can start at least a month sooner in late winter. Fill plug trays with seed-starting or general-purpose potting mix, pressing it down firmly into the cells. Sow a pinch of four to eight seeds per cell, then cover with more potting mix to a depth of a quarter to half an inch (1cm). Water with a fine spray. Direct sowings can commence in spring as soon as the soil is workable and has warmed up a little. Rake the soil level then mark out seed drills about half an inch (1cm) deep and a foot (30cm) apart. Sow the seeds very thinly, cover back over then water along the rows to settle them in. Thin the seedlings in stages until they’re about 2in (5cm) apart for lots of smaller onions or 4in (10cm) apart for fewer but bigger bulbs. Covering early sowings or transplants with row cover or fleece helps to speed things along at the start of the season, and may help reduce the tendency to bolt. In many regions you may be able to buy onion transplants for immediate planting. An alternative is to plant sets. Sets are part-grown onions that are super-easy to grow and save time sowing. On the downside they don’t store as well as onions grown from seed or transplants, and they carry a higher risk of bolting (flowering) which makes the bulb too tough to eat. There are, however, heat-treated varieties available that are more resistant to bolting. Nevertheless, sets are clear winners when it comes to convenience. Plant sets in mid spring into prepared, weed-free ground once the soil is workable and has warmed up a little. Leave just the tips poking up from the ground and space them 2-4in (5-10cm) apart, depending on the final size of bulb you’re after. Some sets may also be planted in early autumn, to give a harvest up to two months earlier next summer. Onions transplanted from plug trays may be left as they are or thinned out once they’ve grown on a little to give bigger bulbs. You can enjoy the thinnings as green onions. As shallow-rooted plants, onions must be kept watered in dry weather. Keep on top of weeds, hoeing carefully between rows then hand weeding within the rows so as not to damage the roots. Harvest time is approaching once most of the leaves have bent down towards the ground. Bulbs will continue to swell over the next few weeks before coloring up nicely in time for harvest. When they’re ready, lift them up with a fork or trowel then move those destined for storing under cover to dry. Any form of cover, from an airy shed to a greenhouse is ideal. In warm, dry climates simply leave the onions where they are on the soil surface. Space bulbs out so there’s good airflow between them. Racks can help with this. This drying process, called ‘curing’, takes about two weeks and toughens up the outer skin of the onion so it will keep for longer. "Hi, I’ve started onions from seed indoors under artificial light. They are long day onions. Do you have a any recommendations on how many hours a day I should have the lights on. Thanks!" "Long-day onions shouldn't start to produce a bulb until day length reaches around 14 hours. You don't want seedlings attempting to begin bulb formation early on, so keep your lights on for much longer than this. I would suggest, at this time of year, a length of around 11 to 12 hours would be perfect, thereby mimicking outside day length."